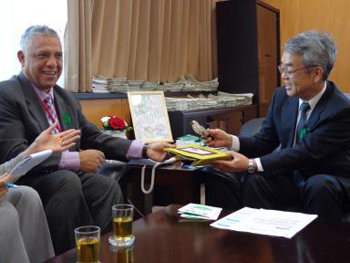 On the morning of April 15, 2015, laureate of the second Hideyo Noguchi Africa Prize Dr. Alex Godwin Coutinho, who was visiting Japan for the World Health Summit held in Kyoto, made a courtesy call to Kenji Matsuyama, Vice-Minister of the Cabinet Office of Japan. Dr. Coutinho described the proactive initiatives he has led to help prevent and counter HIV/AIDS as Board Chair of the International AIDS Vaccine Initiative (IAVI), including research into a vaccine to prevent the virus, as well as his work in West Africa since last year to combat the Ebola virus, including training programs for frontline staff involved in Ebola treatment. 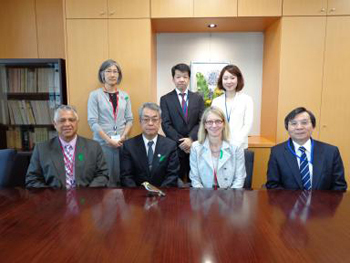 In response, Mr. Matsuyama expressed his respect and gratitude for Dr. Coutinho’s continued efforts across a variety of healthcare fields following his selection as a Hideyo Noguchi Africa Prize Laureate, including working to develop an AIDS vaccine, efforts to fight Ebola, and initiatives to improve the health of expectant and nursing mothers. 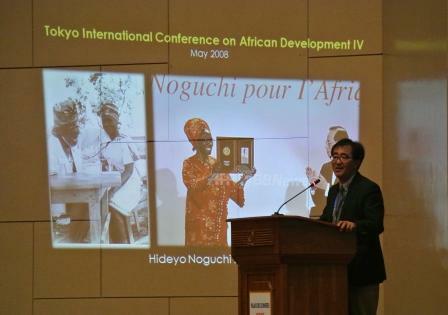 The 9th International Conference on Maternal and Child Health (MCH) Handbook was held in the Republic of Cameroon from September 15 to 17, 2015, featuring the Hideyo Noguchi Africa Prize Symposium, which was held as a session of the conference from 6 p.m. on September 15, lasting approximately an hour. 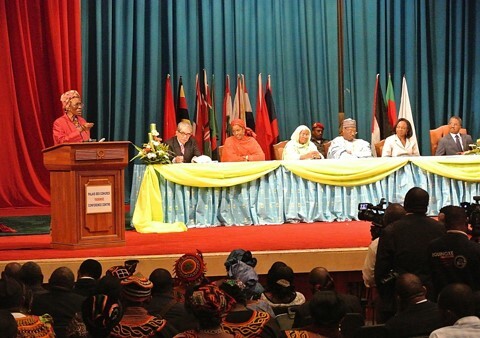 The symposium was attended by participants from around 20 countries, as well as more than 200 members associated with the Cameroon Ministry of Public Health. 1. 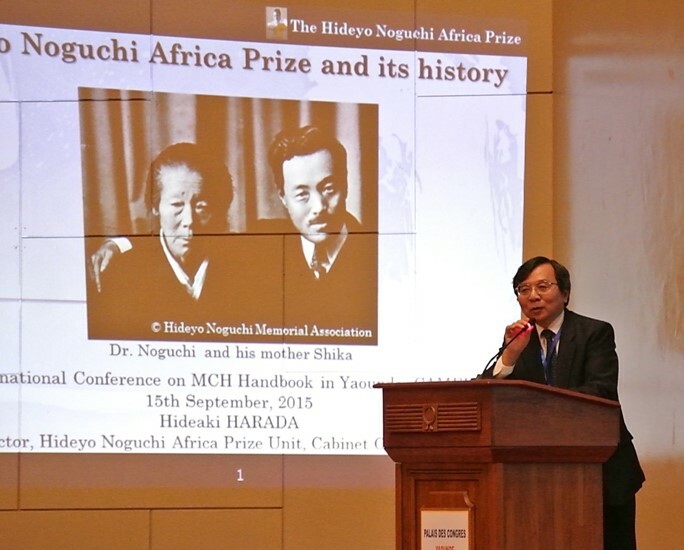 To open the session, Mr. Harada, Director of the Hideyo Noguchi Africa Prize Unit, explained with slides the background and objectives of the prize, the previous laureates, and the achievements of Dr. Noguchi. Cabinet Office of Government of Japan, addresses the audience. 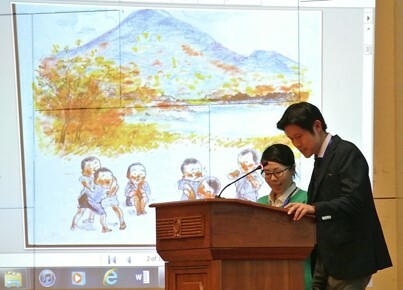 Following this, Mr. Kondo, Deputy Director of JICA’s Human Development Department, and Ms. Komatsu, staff International Committee on MCH Handbook introduced the life of Dr. Noguchi through a picture-story show. present the life of Dr. Noguchi as a picture-story show. (1) Prof. Were pointed our three main reasons why the Hideyo Noguchi Africa Prize is important for Africa: (i) the prize recognizes the need for action to tackle and solve the problems facing Africa through improvements in health and medicine, (ii) as its objective states, the prize aims to contribute to the health and welfare not only of the African people, but of all humankind, (iii) the prize is separated into two categories—outstanding achievements in the fields of Medical Research and Medical Services—emphasizing the fact that only through cooperation and collaboration between these two fields can advancements in the medical field be achieved. Prof. Were speaks at the conference. (2) In addition, Prof. Were suggested ways that the Japanese government, using its JICA channels in respective countries, could work to firmly establish and further raise the profile of the prize, such as launch of a “Hideyo Noguchi Project” aimed at (i) developing human resources to engage in basic medical research at universities and other institutions and (ii) initiating grassroots level programs to improve community medical services. Mr. Sugishita, Senior Advisor to JICA speaks. Dr. Noguchi’s mother attained national certification as a community midwife at the age of 45, and is estimated to have delivered more than 2,000 babies during her career. Her letters to Dr. Noguchi were filled with words of love and compassion for him, moving Dr. Noguchi to make his first trip back to Japan in 15 years to visit his mother. It is the story of love between mother and child recorded in the MCH that makes this handbook so special, as it helps to develop bonds of trust between mother-child health services and the community, creating an environment in which mothers can give birth to and raise their children with peace of mind. This spirit is the same as the love for humanity expressed in the letters between Dr. Noguchi and his mother. A stark reality of the recent Ebola crisis has been a decline in trust in healthcare services by the citizens of many African countries. It is precisely at times like this that we should remember the spirit of these letters penned by Dr. Noguchi’s mother, and work to build a brighter future by rebuilding the bonds of trust in the healthcare system through promotion of the MCH system. As part of the prize money to be awarded for this prize, we are inviting donations widely from those who support the idea of this prize. Your goodwill donations will be used to support the activities of people who are playing active roles in improving medical research and medical services in Africa. About inquiries for donations, please contact with to Citizen Participation Promotion Division, Training Affairs and Citizen Participation Department, Japan International Cooperation Agency (JICA).